First I opened my box to read a ton of "Thank you"s from Melt and lime green tissue paper. Inside there was my eyeshadow stack in Dark Matter and a key ring with a tiny Melt lipstick on it. The top is a mirror and there are four super matte shades that stack neatly. This design is one of the ways I think you can tell these are two makeup artist that own this company because this is a lot of product in a compact package. Perfect for freelance or at home use. I picked the Dark Matter set as I thought that these shades were like nothing I had. I'm sure the other set will be being purchased too, though. These shadows are very large. Here's the stack next to my iPhone 6. Each shadow is 3.57g of product. The stack of four is $48. To compare an Urban Decay single shadow is 1.41g. and cost $18 each. I know some people have been saying that the price was too high but I don't think they knew how large the shadows were. 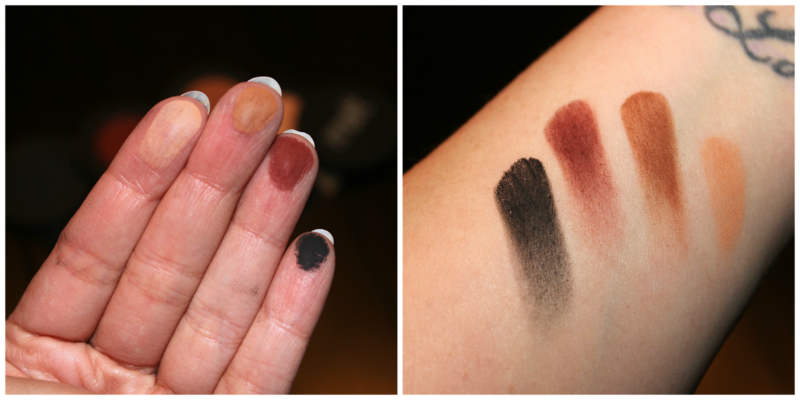 Just from swatching I was impressed by the pigmentation and texture of these shadows. I was like a kid on Christmas Eve. I couldn't wait to play with them in the morning before work. I was trying to figure out how early I should get up so that I'd have time to play. I used all four shades in this look and after using these shadows I can say they are some of, if not, the best matte shadows I have ever used. The black is so opaque and blends out easier than any other black matte I have ever used. In fact all of these mattes blend out easily. The shades melt into each other so well and it is a joy to use them. I am 100% going to be ordering the Love Sick stack and I hope that Melt continues to release more eyeshadow stacks in the future. My final thoughts are that these are a great investment to a makeup collection if you like edgy, smoldering shades and like to play with your makeup. The pigmentation is so intense it's amazing that I had no fall out...at all. And after 8+ hours of wear (with primer) my eye makeup is still in place. Over all I am so impressed with these shadows and I applaud this, obvious, labor of love that Melt has released. if you want to see more be sure to follow my blog for a tutorial from me using these shades soon!